Japan's birth rate slumped to a record low in 2014, health ministry figures show, dropping to 1,001,000 newborns in 2014 - 9,000 fewer than in 2013. The fall is the fourth in consecutive years and comes as the estimated number of deaths continues to rise, at just under 1.3 million last year. Some estimates say that by 2050 the population could be as low as 97 million - 30 million lower than now. 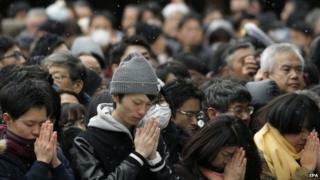 Experts warn the impact of the decline will harm Japan in various ways. A lowering of the number of people aged between 15 to 64 is predicted to lower potential growth and shrink Japan's GDP. That in turn is expected to harm the pension system and other elements of social welfare. The impact in rural areas is predicted to be especially damaging, putting the very existence of some communities in danger. Another decline in the number of children is inevitable as "the number of reproductive-age women is on the decline", an official at the health ministry was quoted by Kyodo News as saying. Government figures in April revealed that Japan's population shrank for the third year running, with the elderly comprising 25% of the total for the first time. The proportion of people aged 65 or over is predicted to reach nearly 40% of the population in 2060, the government has warned.